Are you frustrated because you can’t seem to get any traction when you send out a press release? Are you a leader in your field, and unknown outside it? Are you tired of spending money on advertising that just doesn’t pay for itself? Every entrepreneur, business, and cause can benefit from free publicity. 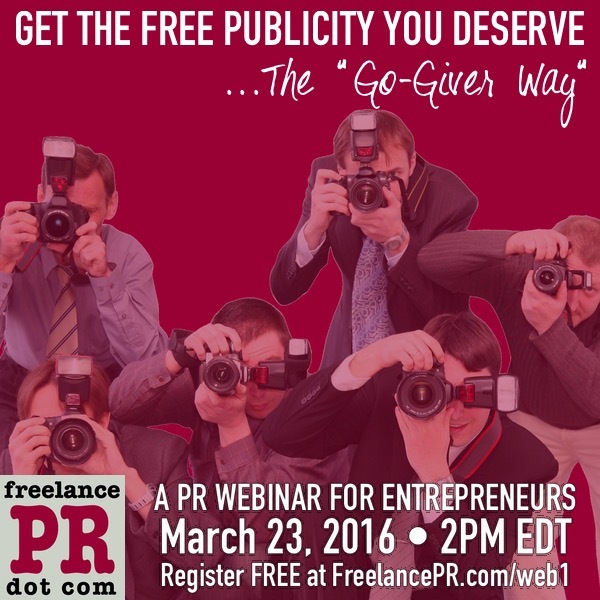 On March 23, 2016, I’ll show you how to get the free media coverage you deserve in a free public relations webinar sponsored by FreelancePR.com. According to an international study by Neilsen, “earned media” is seen as more trustworthy than paid advertising by a whopping 93% of those surveyed. Earned media is media you didn’t purchase–and that’s pretty much the definition of “public relations.” PR is the art and science of persuading the media and your social champions to tell your story on your behalf. In our free webinar on March 23, I’ll be sharing my “secret sauce” for getting FREE publicity with public relations–but with a “Go-Giver” twist. Register now–and when you stay until the end, you’ll get a free thank-you worth $37.